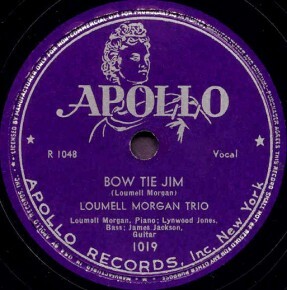 "Blues In The Night"/"Bow Tie Jim"
Above: Photo of Loumell Morgan Trio. The inscription at right side of photo reads "Musically Jimmy Jam Bass player of Loumell Morgan Trio". Members shown in photo are probably (top) James "Ham" Jackson, (bottom left) Loumell Morgan, and (bottom right) Jimmy "Jam" Smith. Loumell Morgan (born 1919) was a piano player. He started his career in 1939 with Slim Gaillard & His Flat Foot Floogie Boys, recording with them until 1941. 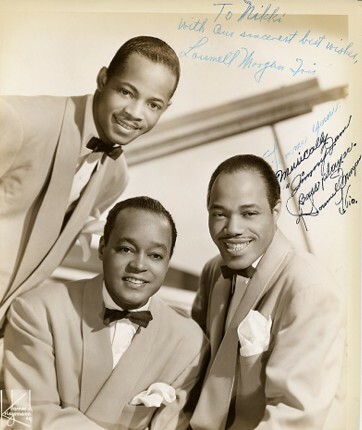 The Loumell Morgan Trio was formed and showed up in two movies in 1943, "All By Myself" (in which they sing the title song and another) and "Melody Parade". They were on several armed forces transcription discs (mid-1940's). As "Loumell Morgan Quintet", there was one record released on Atlantic (#953) in 1951. Morgan joined The Three Flames in 1954 and stayed with them until they broke up in 1964. Above: Label images for Apollo 1019 released in October 1946. 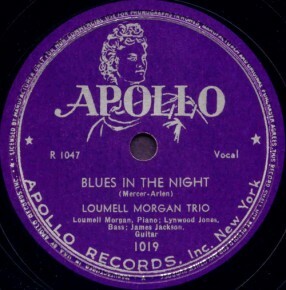 The label shows the members as Loumell Morgan, piano; Lynwood Jones, bass; James Jackson, guitar. Per George Moonoogian, the bass player had been Jimmy Smith a year earlier. A) Click on an option below to listen to Loumell Morgan Trio using Streaming RealAudio.